Nanog53 was in Philadelphia last week. 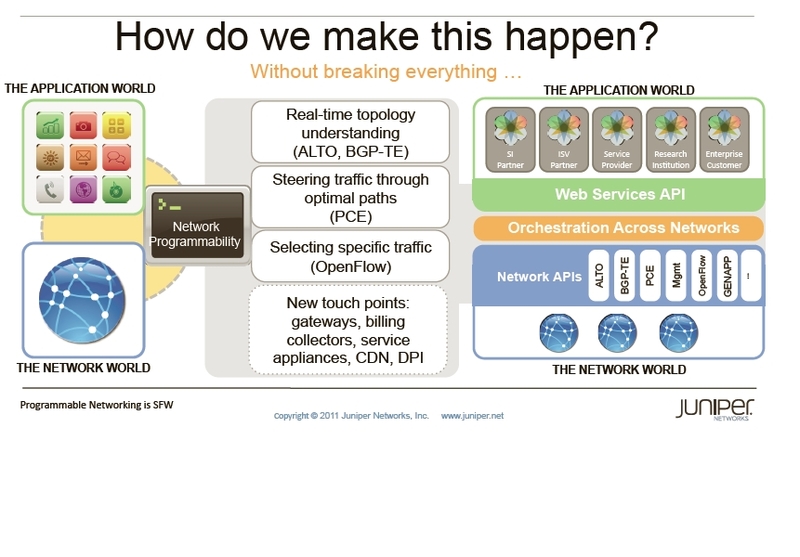 Dave Ward (now Juniper) did the first day keynote on Software Defined Networks. The proposition is that it should be possible to give a greatly improved experience to users if it was easier for applications and the network to exchange information. Protocols: ALTO, BGP-TE, PCE, Openflow, Services Registry. Randy Bush observed in the Q&A that this kind of thing has been tried before, several times, and that security and privacy conflict with it. Greg Hankins (Brocade) reviewed current router architecture requirements. Line rate 100 GbE is one packet every 6.72 nanoseconds. The only memory technology that supports this is embedded on custom ASICs - transfer rates to SRAM or DRAM chips are too slow. 3D packaging might help, but it generates heat in even more density than the existing 2D components. There's a useful table showing what can fit on an ASIC at each process geometry up to 32 nm (slide 14). Peter Hoose (Facebook) gave a lightning talk about troubleshooting - it hasn't changed all that much in the last 20 years, although networks have evolved hugely - he doesn't have solutions, but there's an opportunity here. Rob Sherwood gave the Tuesday keynote about the OpenFlow abstraction - there are at least 75 public implementations, a standards body, and demonstrated interoperability. Use cases in presention - a virtualized control plane; a VM moved from Stanford to Japan without changing its IP address; rerouting of flows between WiFi and Wi-Max; graphing live power and latency variation in a data center. Todd Underwood (Google) was hugely entertaining in his lighting talk about reliable use of probabilistic IPv4 prefixes as a mitigation for the runout of IPv4 addresses. Great acronyms ! Geoff Huston was pessimistic about the liklihood of a coherent single Internet persisting as the IPv6 transition happens at different rates in different geographies. Matthew Petach (who wasn't at the meeting either) took great verbatim notes from the live video stream. If this event is like previous Nanogs, eventually the video will be posted on the agenda page against each agenda item. Meantime pdfs of the slides for each presenter can be found there. The Valley is a strange place most of the time - there's a willing suspension of disbelief which allows for optimism, so people start companies and get financing for unlikely ideas. Yesterday, though, it was the reality that was strange. It started with a posting on Facebook from friends who have a house on Lorne Way, in Cupertino - there was a manhunt in progress, for someone who'd shot several co-workers earlier that morning at the big cement quarry a few miles to the West. Some of the comments, about the advisability of obtaining and using one's own guns, were interesting. #Cupertino was a trending tag on Twitter, at least for the San Francisco area - very little real content, lots of people repeating each other. In the afternoon, Apple announced that Steve Jobs had died - the day after the big presentations for the launch of the iPhone 4S. That created another flood of reaction. There was rain and intermittent sunshine, producing rainbows, which were declared 'a tribute to Steve'. As ever, Apple's information control was impressive - Tim Cook, Apple CEO since August, doing his first launch as CEO, must have known that Steve Jobs was at home - but nothing leaked, from either Apple or the medical people. This morning (6th October) the "suspect in the shooting spree" was shot and killed. People who have had a little time to think and reflect are writing about their interactions with Apple - here are a couple of more personal reflections from people about their early development experiences. NESTA is the National Endowment for Science, Technology and the Arts - an independent body with a mission to make the UK more innovative - it is funded by an endowment from the UK National Lottery. It makes investments, and also publishes research. Yesterday's blog post was notes about a visit to PlugandPlay Tech Center - which is primarily a place for startups to rent office space on extremely flexible terms; it also offers shared space, access to advice, and other things which might help startups get going more quickly (or fail an idea more quickly). Either way, this usually saves time and money compared to doing it alone. PlugandPlay is one example of an incubator. Y combinator, of course, is another. NESTA doesn't mention either of these big examples in its recent publication, focusing instead on Cambridge, England, and on Sweden for examples of success. From the perspective of the Valley, it seems odd to ignore these big operations. Nevertheless, here are some useful quotes from the Incubation for Growth paper. "Absolute measures of incubation are impractical, but performance indicators are useful"
" Business models have changed over time. Since 2005 there has been a reported increase in the cost per job created each year in business incubation in Europe. Some incubators now offer equity finance, and some equity investors offer incubation, with an unclear distinction between both. The challenge for incubators and their funding bodies is to capture some of the value created for incubatees. Generating revenue from services when clients are resource constrained is often not possible without subsidies from public bodies. Corporate funded incubators typically require a strong strategic fit of incubatees with the corporation, which is not appropriate for all ventures. Incubators with mixed funding may encounter principal-agentproblems as they attempt to meet multiple objectives." internationally competitive companies, even if these companies realise their success after incubation." 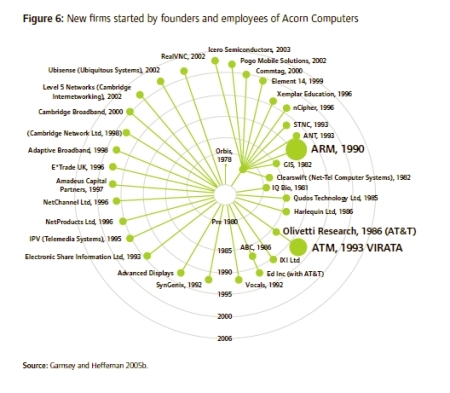 "Here incubation diverges from venture funding. Unlike finance managers reliant on realizing an investment portfolio at a significant profit, incubator managers have several sources of income – rent, grants, public or private consulting, conferencing and other services, share options – and so also numerous constituencies to please, whose interests may not always be obviously reconcilable. Part of the craft of the incubator management team is to understand such conflicts and resolve them so far as possible, while retaining ‘negative capability’ – an ability to improvise and live with the doubts and uncertainties inherent in an entrepreneurial environment." This lengthy report assumes that an incubator is primarily focussed on real estate, renting out space to startups, and that it is therefor geographically anchored to one place. It is possible that other models, building on the 'tech team in one place, sales and product marketing in the large marketplace' principle, which works for startups from small countries, could work. Tom Willey and I went along to the Expo at the Wolfe Rd facility last week. It was very crowded, maybe 400 people in a space which'd have been comfortable for 250. Lots of enthusiastic young companies, and a few people with more experience. Having watched 20 or so of the 32 presenting companies, here are notes. Narvalous is building a social game - avatars, 3D and all. Summary - some real products, lots of things which have been done before, many things which hadn't settled on a revenue model. Glad I wasn't judging, though there was a list of 70 companies, investors and big corporations, at least half of whom had actually sent someone to judge, from the look of the crowd at the front of the room. Expanding on a comment from earlier in the week - the market for ideas is global. So is the market for startups to implement ideas, and for people to work for those startups. This was a response to a post on the Picklive (UK Fantasy Football) blog, describing Dave McClure's reaction to a question about language for a startup's description of itself. Tim Morgan suggests that UK companies shouldn't try to be Silicon Valley companies, but focus on doing something where they have a focus - by which he means an economic comparative advantage, I think. Later he says that "the UK market is easily big enough for a startup to get traction and later become global." This is certainly true for some things - particularly entertainment software. It may not be true for markets where there are very few UK based early adopters, or where the implementation of the idea requires actual hardware. The UK market is comparatively small - the adjacent European market is fragmented by language/tax/law/currency. The US market, and specifically Silicon Valley, has demonstrated success at selling technology into and buying from much bigger markets, including China and India (look at how many people from there, or with parents from those countries, live in the Valley). The Valley speaks (American) English, among other things. It's by far the easiest stepping stone to the global market. You don't have to move the whole company here - but having a sales and marketing presence here tightly coupled to the UK product management and developers will make scaling up and long term success much more likely. The UK used to know how to do this, but has had much more success creating global scale financial services companies than it has had building big technology companies in the last couple of decades. Too much tweeting, not enough blogging, recently. Here are the last few tweets from both my streams, with a little more background. Maybe each of these should go to Google+, and I may start to comment more there - when there's more to say than fits in the 140 character discipline imposed by Twitter, but not enough that I want to keep the words in my own space and track the analytics for them there. For me, LinkedIn and G+ compete for attention; Facebook is much more, though not completely, social than professional. VCwatch is the twitter name I use for, literally, watching what Venture Capitalists are up to - turns out many other people are similarly interested. Other people starting or contemplating starting businesses, some people who service startups or VCs or both, and investors of all kinds are the followers. This piece by Scott Kirsner at The Boston Globe is clearly written, authentic, and posted by Roger Ehrenberg, himself a VC at IA Ventures in New YOrk. Identity is a space in which I've been interested since spending some months corralling the different parts of Cisco which were involved with it, back in 2003. It is used as a catch-all for the concepts of authorization and authentication - who can use which resources, and to what extent are they whom they claim to be. I've known Mike Volpi since he ran Business Development at Cisco, and have been watching his recent work at Index Ventures, and Index Seed, with interest. Worth reading through if you are interested in what kind of companies Dave takes in to 500 Startups, and how much progress they've made. Annejohn is the twitter name I use for 'other stuff'; technical material about infrastructure, items about the gaming space (since one of my investments is in Musemantik, who build tools for adding music to games), and more personal things. Flash memory has evolved hugely from the days when it was a convenient replacement for floppy discs and came on 'thumb drives' - it's now a significant part of the data systems storage architecture design, fitting between on board RAM and spinning media for data access speed. Knowing the guys at Violin Memory (Morgan Littlewood and Matt Barletta are former colleagues) this piece mentions them as one of 10 companies in this space. Fusion-io just completed its first quarter as a public company and announced very positive numbers. More infrastructure - really big touchscreens make new things possible. Tibco has been interesting since I worked with it to get its software certified for use on London trading floors, along with hardware from Alantec (a maker of low latency multiport ethernet bridges) in the early 1990s. This article is an interview with the CEO, Vivek Ranadivé, explaining the importance of capturing, analysing and taking action on data in 'real time'; ie time intervals short enough to make purchasing suggestions to users while they are still paying attention to whatever caught their interest and triggered the vendor's filter. Bryce Roberts is a co-founder of O'Reilly AlphaTech Ventures - here he is writing about how "Training a generation of entrepreneurs to live as cash efficiently as possible during the market discovery phase of a startup, to me, is the biggest innovation happening at Y Combinator these days". We agree strongly, and think that the support of an incubator should be applicable to business types which need a longer horizon than are supported by Y Combinator, 500 Startups, or Technstars - businesses which are building components of infrastructure, which have enterprise customers and may actually build hardware. There have been some interesting ideas in what the science fiction world classifies as the 'hard science' category offered for review in the last couple of weeks. These are intruiging - seeing what people claim can be done with innovative physics - and frustrating - since the proponents can't or won't say enough about their idea to make it possible to do a proper assessment. The end result is that one says "that's a plausible claim, especially given the background of the team", or not, basing the plausibility on independent knowledge of other products or other research. Usually what people are really asking, though, is whether it is possible to build a business from the idea. From long experience with getting commercial enterprises to adopt new technology, the rough rule is that the results they derive from making a change have to be 10X better than the current solution to make it worth disrupting business as usual. This rule is particularly applicable to performance gains and process or component changes. One big exception to the rule is in the rare case where the new thing defends the business from attack, or ransom demands. From the point of view of the company with the new idea, the ideal situation is one where a really big business absolutely depends on their technology, and will take steps to either acquire the technology for itself or have one of its trusted business partners do so, in order to gain continuity of access to the idea. As any of you who follow my Twitter updates (@annejohn) will know, there are regular posts marked 'Infrastructure'. Fundamentaly, Twitter, Facebook, Google, Amazon, Apple and hundreds of businesses like those would not have anything like the reach and market that they do without the existence of the public Internet. The Internet exists as a collaboration between national and international Service Providers, purchasing core IP routers from Cisco and Juniper. The 'cloud', consolidating very large groups of servers into a small number of locations (data centers) where they are connected with access switches and more routers, has grown in effectiveness enormously in the last few years, driven particularly by Google and Amazon. When commercial enterprises were building their own private data centers, they could, and did, seek out 'best of breed' suppliers of switches, routers, storage, and servers. Accordingly a diverse set of infrastructure companies emerged to serve that need. At this point in the cycle, software and applications developers don't need to create and provision their own data centers. They can buy access to computing power at Amazon or Rackspace, for example, at whatever granularity in time, CPU capacity, memory, operating system mix, and bandwidth suits their business model. Correlated with this (it's not clear that it's a consequence) there is a phase of consolidation going on in the suppliers of hardware which go into big data centers. Yesterday Intel announced it is to acquire Fulcrum, a fabless maker of 10G Ethernet switch chips. Today Dell is buying Force 10, which makes 10GE switches. As Andy Bechtolscheim makes clear in a rare blog post, this development makes it easier for competitors to Cisco, like Arista Networks, to buy merchant silicon switch chips without having to make the enormous investment in engineering resource which Cisco did, to build its own switch chip designs. It would be interesting to construct a productivity and profitability index, to compare Fulcrum development with the output from the business units building the Cisco Nexus, 6500, 4900, 4500, and 3900 series switches. Broadcom is the other big competitor for Intel - Broadcom bought Dune, which made remarkably sophisticted switch chips, at the end of 2009. As various of the analysts have been pointing out, these acquisitions leave Brocade (which bought Foundry in mid 2008) out (there had been rumors that Dell was considering buying Brocade). Extreme also makes 10GE switches. Speculatively, consider other components of the data center - like reliable rapid access for remote devices. Web content optimization (Akamai, Limelight, etc) is part of this - so are companies like Zeus and Aptimize, which are to be bought by Riverbed. Also critical are companies like Ciena and Infinera, making it possible to get ever higher data rates over the long distance fiber cable connecting the data centres. Security needs to be embedded into all of the components in a data centre solution, without being over implemented (multiple layers of encryption can happen but are likely to hinder more than help) or making it too difficult to pick the right compromise between useability and protection. Hardware infrastructure is critical to many businesses which normally can take it for granted,just by paying a monthly or useage based fee. There are some big businesses, Intel, and Cisco being examples, without which the software apps business would not be possible. This was written for a West coast based American. It doesn't attempt a complete catalog. If you have corrections or additions, let me know and I'll update it. General observation is that there are a lot of small scale startups, most of them with clue about their specific idea/feature, but not about how to run a business. There's an opportunity to do a 'collect smart people and ideas', and form them into scaled up development teams, with sales and product marketing based here on the West coast. - Scottish Enterprise, a Scottish government funded group, has created this by making grants available against matching funds at small scale (up to $150,000) per startup - doled out in stages and audited with substantial overhead in time and cost for the startups. Lack of bank lending is another factor which contributes - small companies can't get bank loans for operating funds. - There are a few VCs based in Edinburgh and Glasgow, with small funds compared to here. There are some angel investment groups too - they are slow and conservative. - Areas of focus - cleantech gets government funding and attention. Because of the long history of exploration in the N Sea, there is a rich cluster of engineering firms at all scales who are innovative and are used to world wide operations. - There is a noticable bio-tech cluster - the National Health Service is actually easier to work with and more supportive of new things than the US medical business. - Dundee has a well established gaming cluster, rapidly adapting to free to play mobile games from the original large budget PC and console games development they used to do. - Edinburgh has a set of B to B and B to C businesses - Hubdub (games for sports fans) is a sucessful exception. Links for background and flavor ..
Cunning Systems is an investor in Musemantik (Edinburgh), currently raising a seed round. Prompted by a Quora question , I'm re-posting (again) the reference list from an earlier post , since I keep coming back to it. Updating to add the Seedsummit Termsheets reference - the general SeedSummit Term Sheet and an EIS/Angel friendly variant. Updating (June 2012) to add Taylor Wessing's (London) docs list. Term sheets, Articles of Association, EIS docs, Intellectual Property assignments, Section 431 election.